Marvel's Captain America franchise has been its best. Captain America: First Avenger established Steve Rogers (Chris Evans) as the patriotic, loyal, and brave everyman who becomes a super soldier. Captain America: The Winter Soldier was a great genre mash-up of comic book heroics and spy thriller. Now with Captain America: Civil War, the franchise has to carry the burden of being a de facto Avengers movie while introducing two new heroes and tying up loose ends from the other installments. It mostly succeeds with stunning action sequences and signature quips making it a better Avengers movie but a step down from Winter Soldier. The Russo directing brothers threw everything including the kitchen sink in their Winter Soldier follow-up. Whether by design, by mandate or by source material, Civil War was going to be their most ambitious Marvel movie to date. Incorporating over ten superheroes was not an easy task but the Russos deftly managed to give each some screen time and time to explain their motivation for joining the fracas. It's really about Cap and Iron Man (Robert Downey, Jr.) though and their opposing philosophical differences are what drives the narrative. The exciting opening action sequence that finds Cap, Falcon (Anthony Mackie), Scarlet Witch (Elizabeth Olsen), and Black Widow (Scarlett Johansson) on the trail of Crossbones (Frank Grillo) and his minions trying to acquire a biological weapon ends in horrific fashion. After a long thrilling chase and fight scene, Scarlet Witch tries to contain a bomb but unwittingly causes major collateral damage resulting in part, the deaths of some citizens of the fictionalized nation of Wakanda, a secluded region of Africa that is home to T'Challa (played wonderfully by Chadwick Boseman) aka Black Panther and his father's kingdom. It's the last straw for the U.S. government and governments around the world of the perceived reckless vigilantism the Avengers seem to display as they police the globe without oversight, concern for sovereignty or human life. It's something that the U.S. Secretary of State Thaddeus Ross (William Hurt) makes clear with the Sokovia Accords, named after the place where the Age of Ultron disaster took place. An agreement to make the Avengers under the command of a U.N. panel relinquishing their independence and requiring each "enhanced person" to sign it. Tony Stark is reminded of the toll their actions in Sokovia took with a visit from a grieving mother played by Alfre Woodard. Her son died and she blames Tony and the Avengers. It sways Stark to be in favor of signing the accord. Cap isn't too keen on giving up his freedom as you would expect, believing that despite the collateral damage the Avengers save lives and being held down by a committee seems foolish. They both make credible arguments, in essence making them both right, but never turning one into a villain. It's a delicate balance that writers Christopher Markus and Stephan McFeely make throughout the film as each hero has their own viewpoint, some aren't as black and white, but do eventually take a side. The premise of reining in these powerful superheroes is only one aspect of the Civil War. While pitting the Avengers against each other is a fun excuse to get them to battle, there's also the framing of Bucky Barnes (Sebastian Stan) after an explosion at the accord ratification in Vienna that takes the life of King T'Chaka. It also serves as T'Challa's motivation for revenge to kill the man that murdered his father. T'Challa is integrated into the plot perfectly. Boseman infuses the character with the regalness, dignity, and confidence befitting a prince, then as the king, of the great nation of Wakanda. As the Black Panther, T'Challa gives the Marvel Cinematic Universe a dynamic superhero who's a brilliant and relentless fighting machine not named Black Widow and whose solo film will undoubtedly be one of the most anticipated. The introduction of a hero like Black Panther helped not only to establish and set-up his own film but elevated the stakes in Civil War. Not as smoothly injected into the film was the highly touted arrival of the new Spider-Man played in convincing Queens fashion by Brit Tom Holland. Wedged into the film was a scene where we meet the traditional version of Peter Parker - the talkative teenager trying to scrape some money together with the terrible homemade costume - for the first time. Stark comes recruiting the young street hero to join his team to fight Team Cap. Apparently, he discovered Spidey on YouTube and is surprised by his attractive Aunt May (Marisa Tomei). I have to question May's parenting because why would allow a middle-aged billionaire to speak to your teenage nephew in his room behind a locked door? Introducing Spidey now that Sony and Marvel Studios are sharing the property was a smart move that adds to the blockbuster but still feels forced into yet another brand builder. As awkward as the move may be it pays off. Holland is great as he nails the web slinger's personality from the comics. The centerpiece of the movie, the one briefly seen in the trailers is the airport confrontation. This is the spectacle the movie was made for and fans demanded. It's shot with great energy and ingenuity by the Russos. It's really a sparring session because Team Iron Man is trying to detain Team Cap but not kill them. Nonetheless, it's an entertaining sequence that goes on for quite a while, getting your money's worth, as the heroes go head-to-head. Unsurprisingly, Spidey and Ant-Man get the best lines and add some new wrinkles and tricks that keep the battle a crowd-pleasing event. Of course, it's all fun and games until the Vision goes too far. Ultimately, it boils down to Cap defending his best friend Bucky against Stark until the shocking twist that changes everything. This is where the movie feels like a Captain America movie again. The chase for the manipulator behind the bombings Baron Zemo (Daniel Bruhl), who lost his family in Sokovia, is the one who freed Bucky from custody and reactivated him using the original Hydra password. Marvel villains are usually irrelevant, just an instrument to drive the heroes plot but overall make a very little impression. Zemo is used similarly but intentionally as he pits hero against hero. There's more to Zemo, an almost sympathetic dimension to his rage and sociopathological behavior, that at least separates him from Ultron, Loki, and Red Skull. 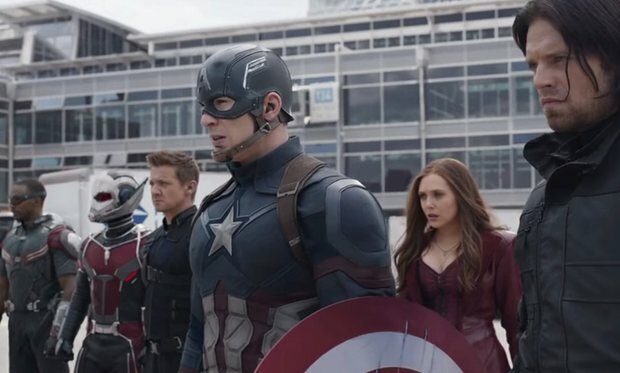 Captain America: Civil War is a well-executed blockbuster that is long but entertaining. A turducken of a film, that stuffs an Avengers line-up, a Spider-Man introduction, weaves Black Panther into the story, and uses the themes of accountability and friendship in a Captain America movie. It's not perfect, there are lulls that occasionally drag but the highs outweigh the lows and it's not as cohesive and sleek as Winter Soldier. Anthony and Joe Russo expertly manage this behemoth of a film that feeds Marvel fans a gluttony of great moments, emotional character beats, requisite laughs in another franchise-launching chapter.